Announcing the ECS Uniform Policy and Shopping Links! Hello, ECS families! We are about four weeks from the start of school, and things are really ramping up. After much time and research, we have generated a uniform policy replete with some helpful links on how and where to make uniform purchases. If you decide to utilize Old Navy’s current sale involving many approved uniform garments, I believe the sale ends August 15, so you should act soon, whether online or in person! Go HERE to see our Uniform Policy. Last week I was at a national conference for the Association of Classical and Christian Schools in Dallas, TX, and I attended a workshop led by George Grant, pastor of Parish Presbyterian Church in Franklin, TN, who has quickly become one of my favorite biographical speakers. The workshop was entitled “Why Is This So Hard? The World, the Flesh, and the Devil Against Reformation.” Now, while Pastor Grant was addressing educators, the message has very broad application. His thesis was pretty simple: It’s hard because it’s supposed to be. I guess I should have seen that coming, but I was expecting – in typical workshop fashion – something like, “Ten ways to maintain your passion and focus when the going gets tough.” Instead, I got the blunt reminder that nobody ever said anything worth doing was easy…because it almost never is. In fact, what is easy? I mean, really. Try to think of something that is easy that is actually worth doing, important, valuable, culture-changing, lasting, whatever. None of it is easy. Because if we are a threat to the world or the devil, then we should anticipate resistance; if the world and the devil are fine with what we’re doing, then we should anticipate little resistance. Am I suggesting that anything that’s easy is of the devil? No, not necessarily. That’s not the point. But when we find ourselves asking “Why is this so hard?”, we should be encouraged to know that the difficulty is probably a good sign. So, what do we need to remember when it gets hard? We are making the enemy nervous. He is threatened and is forced to direct greater attention our way because we are rattling the gates of the the Kingdom of Darkness. And anything that Christians do to generate greater happiness, influence or dominion in the domain of darkness makes the devil nervous. We are used to failing – and so is everyone around us who is trying to steal our dreams. People quickly point out all that could go wrong, assuming that we can’t possibly have counted the cost or we’d stick with what we’ve always done. Growth is uncomfortable. In fact, growth cannot happen in your comfort zone. Don’t invest those dollars, because you may lose them. Don’t start that school (or business), because people might not come and then what will you do? Do you have any idea how much work it’s going to be to lose fifty pounds? You’ll probably just burn out and quit, so why bother starting? Just be content with who you are. If you ask for that raise, your boss may tell you, “No,” and that would be humiliating. It’s better to just take less money and retain your dignity. The list goes on and on and on. But in each of these examples the reward could be tremendous, but it will not come without risk. Easy success breeds independence. If it were easy we would become self-reliant and would not depend on God as we ought. God forbid. Others have gone before us…and it was hard for them, too. Grant pointed to the examples of Charles Spurgeon, George Whitefield and Jonathan Edwards. All three men faced tremendous adversity because while God was using them to make a lasting spiritual impact in the world. So what about us at ECS? We will be collecting registration paperwork and first semester payments in a matter of days, and we are squarely in a holding pattern, waiting for new students to enroll and for the first semester to begin. Many of us are excited and downright impatient. Others are nervous. Still others are overwhelmed. Personally, I’m all of them at once. But we can be certain of this: Just like anything else with a gargantuan upside, this is going to be hard. It’s going to be hard because it’s supposed to be. We are a major threat to the enemy and to the world, and we are looking to create generation after generation of worshipers who will be dangerous weapons in the hand of our Redeemer King. God willing, they will be familiar with hard work mixed with happiness; the mindset of fallen man filtered through Scripture and the mind of God; their place in the river of Western culture and the river’s source and destination. Our striving would be losing. And he must win the battle! If you tell a lie frequently enough and convincingly enough, people are going to eventually take the lie as a given fact. There is tremendous power in narrative. The classic example with which we’re all familiar is the preposterous theory of evolution. At every turn, academics and academic wannabes push the evolutionary agenda…with particular attention given to children’s programming, whether on TV or at the museum. “It’s taken us millions of years to get this far!” says one animated shrimp to the other (Happy Feet Two). “The sting ray evolved from the shark about 150 million years ago” (Jeremy Wade in River Monsters, one of my favorite Animal Planet shows). Our spongelike minds of our children absorb truths and lies with natural ease and enthusiasm. We must be intentional about what we give them to absorb, particularly in the grammar years. We go to church on Sundays to be fed for the rest of the week. My personal devotions are more important than corporate worship on Sunday mornings. The list goes on. These are tricky issues to address, but the composite picture here is that believers need to be in an ongoing and passive state of preservation with a defensive mentality, when the New Testament picture of the role of believers in the world is decidedly more assertive. We may be peace-loving, but not at the expense of the name of Christ. The military needs Christians because the government exists to bear a sword, and killing in the context of war is distinct from murder. What we do on Sundays is powerful as we gather corporately to worship God together. Approaching Sundays with the typical consumer mindset (i.e., primarily to get something rather than to contribute) is misguided. What is my children’s school doing to prepare my children to advance the cause of Christ in the world? 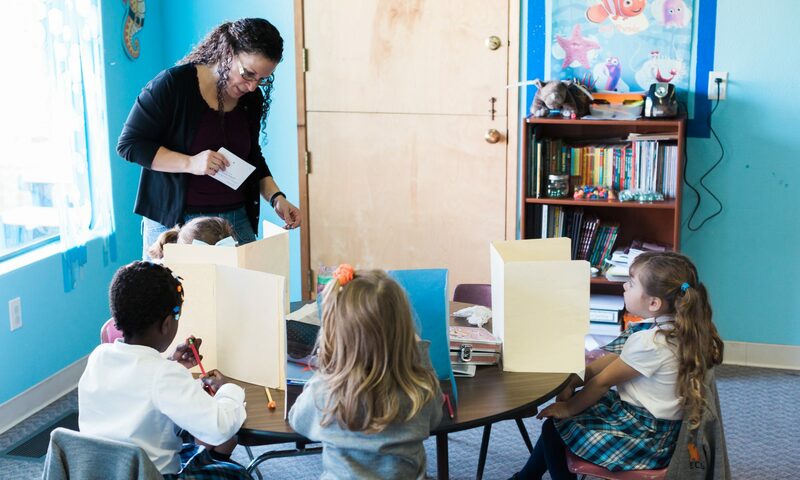 How will Evangel Classical School train and equip my children to be worshipers of Jesus Christ? If this is the aim, an excellent academic education will be a necessary outcome, though not the chief end in itself. Learning to identify logical fallacies, anticipating historical trends, understanding complex concepts and clearly and winsomely defending or combating arguments will serve our students well in college and the workplace, to be sure. But more than that, by God’s grace it will better equip them to be a powerful presence for Christ in their homes, communities, workplaces and churches. Our challenges transcend debunking evolution. Christians are in an ongoing battle to propagate an accurate narrative about Christ, Christians, and the Church. The enemy is working tirelessly with the propagation of a powerful and insidious narrative of his own, but we want the world to know that Jesus Christ is Lord over all the world, and that impacts all spheres and epochs of life, from creation to His coming and beyond. Greetings once again from Evangel Classical School! Over the course of the last several months, I’ve had occasion to think about all of the really great things that started out really, really small. It is my prayer that Evangel Classical School would one day be on that list. Right now it is small, to be sure (we haven’t yet had any classes), but with God’s blessing and our hard work it can be great. Andy Bowers, Morgan Higgins, Sean Higgins, Jonathan Sarr, Sonja Sarr, Jen van der Beken, Ron van der Beken. The remaining teacher(s) are still to be determined. Of those listed or referenced, five have teaching degrees and the other two have experience educating their own children in the classical Christian model. All are committed to the classical and Christian model of education along with a Kuyperian-Calvinistic worldview. Teachers will primarily teach subjects rather than grade levels, as we will generally have Kindergarten together, grades 1-3 together, and grades 4-6 together. Sean and Andy will handle the majority of the 4-6 teaching (including Latin 1 to grades 4 and up). Morgan and others to be announced will handle the majority of the teaching in grades K-3. $4,000-$4200 per student, depending on the payment option. Option A (one payment of $4000/child): Due July 1. Option B (two payments of $2000/student): Due July 1 and January 1. Option C (10 payments of $420/child): First payment due September 1. Option D (12 payments of $350/child): First payment due July 1. When is the first day of school? Tuesday September 4 (the day after Labor Day). Will students have PE? We’ll likely have strategic activity during recesses and potentially even give “homework” PE assignments for the parents to administer. Will there be discounts? None at this time. Is any financial assistance available? There may be some assistance available. All requests should be submitted personally or via email to Jonathan Sarr. What if my secondary student has not had Latin or formal logic? We will offer Latin 1 (technically a grammar class) to interested secondary students or encourage them to take a Latin class online. We will offer formal logic to secondary students. What additional fees will we incur? At this point, none. There will be no registration or activity fees. After August 1, however, there is a $420 withdrawal fee per student for any withdrawals. Will we buy our own books? No. Curricular costs are included in tuition, and consumable texts will be issued to the students and will be yours to keep. Families incur the cost for any replacements (lost, damaged, stolen, etc.). So once more, what does my tuition payment cover? The cost of the classes and all curricula. What does tuition not cover? School uniforms, replacement of lost, stolen or damaged books and the occasional fee related to a field trip (e.g. museum admission, etc.). You mentioned uniforms. Where do we buy those? More information is forthcoming on that. Now I should note that plans are by nature not reality; they chart a direction. As such, some of the details of our plan may change based on actual enrollment numbers or our facility, but we’ll be quick to communicate changes of any significance, should they be necessary. We covet your prayers as desperately now as ever. Perhaps you and your family will be part of a fantastic story and testament to the kindness of God to ECS and our people in the near future. As always, please feel free to contact any of us if you have any questions. Greetings from Evangel Classical School! It’s hard to believe that we’re now but a few days from our follow-up meeting when we look to make the official announcement of our plans for ECS this fall. So if you haven’t done so already, please plan to be at the meeting on Monday night, April 30 at 7:00PM at Marysville Seventh-Day Adventist Church to hear more about what’s to come in the fall of 2012. In previous news posts, we’ve tried to explain what is distinctive about the classical and Christian model. One piece of the model that I appreciate the most is the commitment to being as true as possible to the various disciplines. For instance, that requires going beyond the memorization of formulae in mathematics, and it involves being unafraid to ask, “But why?” when it comes to history and the Bible. But also related to history, there is a strong commitment to making use of primary resources. Any historian will tell you that this is what historians do: they spend as much time as possible examining primary resources in order to get the clearest picture of the period in view. Contrast this with what many bad historians do (along with many schools and universities): they rely on secondary resources, or another man’s work and explanation of what happened rather than taking a look for themselves. They end up with interpretations of interpretations. Now don’t get me wrong; obviously, scholarship has its place. We value the work of good historians who have themselves examined the primary resources and done much of the legwork to make our study easier. But we still recognize that the more removed we are from the primary resources, the less likely we are to be accurate in our understanding. If you’ve ever played the telephone game, you know what I mean. In a circle of twenty participants, by the time your original message gets back to you, you’re fortunate if the idea is in tact, let alone the words themselves. Another illustration might be our appreciation for theologians. We are very thankful for the way many Church fathers and theologians have labored to make the Bible and its doctrines more understandable. But he is no student of Scripture who only reads the words of men but fails to read the Word of God. We want to train our students to be able to read the works of theologians and to discern truth from error. That requires an accurate understanding of Scripture. As for history textbooks, they are particularly helpful for younger students who are learning how to study. But as students become able, we want to introduce more and more in the way of primary resources…just as with Scripture. That is true to the discipline of history, it yields more accurate understanding, and it’s challenging for the mind. In case you’re wondering why I’ve devoted a news post to this matter, I do so because this right treatment of the disciplines appears to be getting rarer and rarer in our schools. As a culture, we are about the business of forging lazy learners who would rather get their history from movies or TV, who would rather have a dependable formula whether they understand it or not, or who are satisfied to be able to speak a language without understanding how it’s constructed or where it came from…or where it’s going. I’ll finish by anticipating an objection: Primary resources are too hard for our students to understand, so studying them is then a waste of time. Well, we can’t blame anyone for that but ourselves, and we shouldn’t expect that anyone else is going to fix it. And rare is the student who finds out on his own how rewarding a right treatment of history can be. If God wills to give us the energy to teach them and grants them the appetite for knowledge, our students will soon be able to read more widely than we can and with greater understanding. (Think about the possibilities that would bring!) But we cannot expect that will happen if they only read simplified and modernized language and potentially-biased interpretations of history textbook writers. They must supplement their historical diet with a steady supply of primary resources. We’ve said before that these are exciting times in the life of our school. I was talking with someone earlier this week about how we’ll be able one day to look back on these days with an affectionate grin, grateful for how God made us dependent upon Him with so few answers to our questions, and grateful that we likely won’t be repeating them. But who knows? As YOU know, we’re in the planning window between April 2 (the soft deadline to at least express interest in sending your child(ren) to ECS) and April 30 (our scheduled follow-up informational meeting to share our official plans for fall 2012). That means we’re feverishly making phone calls and having meetings in order to make decisions and plans as best we’re able. We covet your prayers in this time, and as always, we are available to address questions, comments or concerns you may have. Again, do circle April 30 on your calendar as the date of our follow-up meeting. It will be at 7:00PM in the basement of the Marysville SDA Church. “Christians should desire for their children to learn of Christ at school, as well as at home and church. The devotional and spiritual aspects of the Christian faith are often emphasized in the home and church. But there is more to our faith than sacred activity and devotional experiences. Schools, regardless of their kind, are places where children are inescapably trained in some view. Christian schools ought to be places where children are trained in the Christian world-and-life view. I assert that it is the duty of believers to see to it that their children’s education is consistent with their Christian convictions (Eph. 6:4; Deut. 6:4-7). “The classical emphasis in structure, content and method is unsurpassed for providing the tools of learning. This emphasis heartily provides for intellectual development, academic achievement, and moral stability. It provides a way to educationally apply the mandates of God’s Word, to seek true knowledge, understanding, and wisdom. In our growth in the mastery of God’s world, as well as His Word, we apply that ancient mandate — ‘Fill the earth and subdue it; have dominion’ (Gen. 1:28, cf. 2:20). Through high quality education we also apply the mandate to love God with our hearts and heads. “Christian education is our duty to God (Eph. 6:4; Deut. 6:4-7). Classical education in methodology and content equips learners with the tools of learning. Here is classical and Christian education in a nutshell: the trivium provides the tools of learning, Scripture and the classics furnish the core content, and Biblical truth is the fixed point of reference. The trivium is the hammer, the classics are the wood, and the Bible is the ruler” (10). At Evangel Classical School, we share a focus with the classical Christian school movement on the liberal arts (which are largely misunderstood in their own right) and the intentional blurring of the disciplinary lines. Many modern educational attempts to “differentiate” instruction (to use the jargon) may involve two disciplines (e.g., English and social studies) approaching a common project (e.g., a report on Spain). But it usually stops there, and students’ minds are as divided as their class schedules. A common outcome is the math student who doesn’t do English or the history buff who hates the sciences. Sound familiar? In many Christian schools, attempts to integrate the Bible into the curriculum are mandatory afterthoughts to the real lesson which could do just fine with or without the obligatory biblical add-on. “Classical Christian academies teach all subjects as an integrated whole with the Scriptures at the center” (111). That is the educational approach to a comprehensive view of Christ’s Lordship. We often compartmentalize and categorize much of life when all of life is an “integrated whole” under the umbrella of Christ’s Lordship. Though identifying problems generally is easier than suggesting helpful solutions, we like the classical Christian alternative with its view to a complete, comprehensive education that has interest in the far corners of Christ’s domain. And that means trying to perceive all of it. A what?! You ask? A raggant. Let us explain. Perhaps you’ve heard of a an enjoyable trilogy by ND Wilson entitled 100 Cupboards. If not, we heartily recommend it to you. In the series, the main character Henry York, learns that one entire wall in his attic bedroom comprises ninety-nine cupboards (there’s one more downstairs – that’s the one hundredth) which are actually doorways to other worlds that have been plastered over and hidden from view. Henry’s adventures begin when a magical creature called a raggant relentlessly, tirelessly and successfully travels far and wide to find young Henry. “It stood up on all fours, shook out gray feathered wings, and looked around the table. It was shaped almost exactly like a rhinoceros, only it was eighteen inches long and winged. It had one short, blunt horn, split and cracked at the end. It’s belly hung almost to the ground, like a basset hound’s” (278). And this is a dignified, proud creature that takes itself way too seriously, which is completely comical and ironic given its ridiculous appearance. Beyond this, the creature is rather endearing in his determination, loyalty, and comical stoicism. “The raggant didn’t have any extra senses. He only had one, and it interfaced everything into an amazingly complicated but entirely accurate caricature of whatever worlds were within his range” (226). That is a picture of how we want for our students to perceive Christ’s domain academically. We want their perceptions of the world to be less compartmentalized (like human senses) and more academically integrated like the blended, combined senses of the mighty raggant. A raggant has no conception of distinct senses; he cannot help bringing his one interfacing and accurate sense to bear on his perception of life. We want that for our students, too. Whether examining a flower or a Rembrandt painting or a geometric formula, we’d just as soon have them unable to separate the truth from the goodness, the beauty from the science and so on. And the classical and Christian model lends itself to that. Thankful that someone else has come up with such a powerful example for us (thank you, ND) in the form of an endearing and novel magical creature, we can’t think of a better mascot for our school. ND Wilson and Random House have kindly granted us permission to use the raggant as our mascot. It’s hard to believe that we are staring down the barrel of April. That’s a beautiful time of year here in the Pacific Northwest, but it also means we’re only five turns of the monthly calendar away from the first day of classes at ECS. That’s crazy. A few years ago people stopped telling me that the years go by faster the older you get, and I suspect they stopped telling me because it was obvious they didn’t need to. Well, the months are passing quickly for sure, and we’ll be buying school supplies in no time. As April approaches, so does April 2, by which day we have asked any families who are interested in having their children attend ECS this fall to express their interest on our Interest Form. If you fit that description, please take a few minutes and fill out that form for us. Finally, if you’re interested in asking more questions in person or discussing ECS or classical Christian education, we are having one more open house/open forum at the home of Chuck and Teresa Weinberg on Sunday night April 1 at approximately 8:15. As before, all interested parties are welcome. If you’ve spent any time on the ECS website, you will have noticed the dashing visage of one Abraham Kuyper adorning the homepage. If you click on his nose (or any part of his head, I suppose), it will take you to this link. Though we have a whole page devoted to Kuyperian Calvinism on the site, it is good to talk about Kuyper’s mindset and influence on our school. While trying not to duplicate everything from the bio page, I want to offer a bit more explanation as to what we find so compelling about Kuyperian Calvinism. Now, most Christians will agree with Kuyper because his statement is thoroughly orthodox. And yet its implications are, in fact, comprehensive. Take work, for instance. Many Christians believe that work is spiritually neutral. It’s separate from what you do on Sunday mornings, so it’s not a spiritual thing. Having a good work ethic and good reputation are fine, but what happens from 8:00-5:00, Monday through Friday is not the real, spiritual stuff of life. The same thinking could apply to education, politics, etc. Enter Kuyper. Kuyper believed that if Christ is Lord over all the world, then that includes the Christian’s workplace. He actually cares about widget making for the glory of God, because Christ isn’t only about His work in the Church, but rather everywhere, and in all spheres. Christ’s control and care are truly pervasive (Colossians 1:16-17). So the Christian dare not approach education, law, politics, church, nutrition, landscaping, finance or metallurgy as though Christ does not care; Christ cares more than anyone. We, as the Church of Christ, are a strategic instrument that the Lord is using to effect His will in the world and beyond (Ephesians 3:10). We at ECS hold in happy tension a premillennial eschatology and the fact that Christians are supposed to behave joyfully. Although the world will progressively and morally decline in anticipation of the second coming of Christ and His subsequent millennial reign on the earth (spoken of in Revelation 20), the spirit of the New Testament commands to believers is in no way pessimistic or dour. We are rather to be joyful and confident in Christ as we obey His commands to love one another (John 13:34) and represent Him in the world, even if the world will grow increasingly uncomfortable with our presence. This was the mindset that drove Abraham Kuyper. He believed that Christ is present and interested in politics, education and the Church, and Christians should be, too. For that reason, he was very active politically, educationally and ecclesiastically. Due in no small part to the work of Abraham Kuyper, church culture in the Netherlands was powerfully changed as Christians were educated and emboldened to represent Christ in all spheres of life. This undergirds the vision of ECS. We are passionate about helping our students to realize their place in the Church and the world as Christ’s happy ambassadors (2 Corinthians 5:20). And we want to equip them to do this with joy and effectiveness. That sort of mindset will transcend occupations and will make an already-nervous enemy tremble. What’s Next? Lots of Work! Last Sunday evening many of us (i.e., the Committee and a number of interested families) gathered to talk about ECS and the classical Christian model of education. While there were a number of things we discussed that would be worth reproducing for you here, there is a thick thread that runs through everyone’s task list: WORK. And this is a problem, because we hate it. We don’t like having work to do, and we definitely don’t like being told to do it. We are accustomed to ease and given to laziness (which we call “efficiency”). But none of that changes the fact that there is work to do. Maybe you’re the father of a second grader and you’re thinking about homeschooling your daughter in this model next school year. Perhaps you’re a recent high school graduate who wishes she were trained in the classical Christian model and who wants to make up for lost time. Or maybe you’re a grandparent who would like to see ECS well-established by the time your grandson is ready for kindergarten. It’s even possible (not as likely for those reading this) that you’re an eighth-grader who is thinking about attending ECS as a freshman, but are despairing because you have never studied Latin or formal logic. Whatever the situation, you have plenty of work to do. Why is that? For starters, parents are responsible for the education of their children. Sadly, many parents abdicate this responsibility. Others delegate it to a school, expecting for “education” to happen from 8:00AM to 3:00PM, Monday through Friday. Others know better and strategically select a school that will effectively support them in the education of their children by reinforcing common biblical principles while loving academic content into their children better than they could as parents. But regardless, the parents are responsible. And if those same parents are going to make good decisions, they must be well-informed. The recent high school graduate should’t expect to fully understand the Greco-Roman mindset of the first century by reading one poem by Homer…but it can sure help. To know better, or how to best prioritize your time takes work. You have to learn what to learn. Then once you’ve decided, the real work actually begins as you do read Homer and Virgil and Milton and Euclid and CS Lewis and study Latin and logic and more (or More). Some would use that to excuse inactivity, because making excuses is easier than work. Proud and well-informed grandparents are excellent ambassadors with contagious enthusiasm. But if they want to be able to effectively champion the school or speak of it intelligently to others, they have to learn more. We’re very glad to help, but it still takes work. The student looking to enter the classical and Christian model had better be ready for (yup, you guessed it!) work. Now the work is supposed to be hard and fun and rewarding and rigorous, but it’s still work. If you can work hard and you’re open to the possibility of sacrificing the immediate gratification of straight A’s for sake of the greater, more lasting payoff of being able to use your mind, to handle the tools of learning as a homemaker or a widget-maker, and to be able to understand your place in the stream of Western culture, then you’ll be just fine. We believe that these things make for better worshipers, and becoming a better worshiper takes work…for all of us. But be working hard now, and be ready to work hard next year. I write this first for myself. I’m excitedly overwhelmed by the amount of work there is to do, and yet I know that this is a necessary and precious season in the life of our school that is marked by high dependence on God. And we will be quick and glad to give Him the glory for the fantastic outcome (or shall I say, “process?”) we anticipate by faith. As always, if we can better inform your work, or if we can answer any questions for you, please don’t hesitate to ask. Greetings from Evangel Classical School! I trust this finds you looking forward with eagerness to next week and the official start to spring. Two things before I offer us all an aesthetic challenge. Please remember that we are asking families who are interested in ECS to fill out the Interest Form on the school’s website by Monday April 2. There is no obligation to enroll nor does this secure a spot in the school for those who do so, but it will help the Committee to make the most informed decisions we can in anticipation of our April 30 follow-up meeting (7:00PM at the Marysville Seventh-Day Adventist Church). While you’re on the website, spend a bit of time looking around as there are some recent additions (e.g., the page on Kuyperian Calvinism). Regarding these emails, we are modifying how you will receive them. I suppose this is also your opportunity to opt out, if you wish (though you can do that any time afterward, too). The new process will enable us to send this information from our website and post the information on the website in one act. Very simply, you will soon receive a confirmation email from Feedburner. If you want to continue to get these newsletters, please follow the directions (it involves a click of the mouse to confirm you’re not getting spammed by a machine). From that point forward, you’ll receive these mailings via a feed rather than from me. Also, I apologize ahead of time if you receive retroactive mailings of information I’ve already sent. As we load past newsletters as posts on the site, you may receive them a second time as a feed. If so, please disregard or re-read at your leisure. Many schools today – especially Christian schools – keep the pedagogical tools named Truth and Goodness clean and well-oiled. They are effective and powerful for the development of young minds and the shaping of students’ worldviews and sense of morality. They are useful for life after high school in the home, workplace, military or college. But by themselves they make for an incomplete education. Perhaps it’s better to think of a pedagogical stool with three legs named Truth, Goodness and Beauty. In most schools, the stool is wobbling on two legs because – if it’s present at all – the leg named Beauty is woefully stubby. And this is a statement that many schools make in a number of ways. We live in an age of commitment to self, and moral relativism. (For ME, I think that killing a baby in his mother’s womb is okay if his quality of life would be less-than-ideal…for ME. And don’t judge me because I’m entitled to my opinion.) It’s little surprise then, that aesthetics (or any formal training to better appreciate them) is largely an afterthought…or even a non-thought. How on earth can we expect our students to appreciate music by dead guys when we have no grounds for telling them it’s worth listening to? “The triad we want to urge in classical Christian education is truth, goodness, and beauty. When it comes to aesthetic issues, the Christian world is horribly compromised. One of the tasks of the Christian school is to help bring us out of this relativism by teaching students to love that which is lovely – in music, in painting, in poetry, in drama and in dress. Whatever is lovely, Paul says, think on this” (187). To say that an appreciation for beauty is neglected in the modern educational system is a gross understatement. Is it any wonder that the budgetary axe falls at the root of the Tree of Fine Arts when those who are making the decisions tend to have little appreciation for the arts themselves? The statement we are making with our checkbooks is that there is greater value in a touchdown then a downbeat, and and greater value in the applause of fans gathered in a gymnasium than a concert hall. Students’ test scores continue to drop, and we wonder why. After all, we’re educating our students with a strong emphasis on truth and goodness, right? What more could there possibly be? Where does this mentality come from? Well, it should hardly come as a surprise. Our society does not appreciate beauty like it used to. Fine musicians have to play in multiple ensembles just to make ends meet; artists are stereotypically poor; Hip Hop artists that you’ve never heard of make more money in a night than Bach made in his lifetime…and 300 years from now they’ll still be listening to Bach (maybe not, at this rate! ), while it’s doubtful that Lil’ Kim or Flo Rida will top many playlists (and yes, I had to look up those names). “Of course, we should dress for comfort, but the biblical view is that we should also dress for the comfort of others. Today our natural tendency is to dress to suit ourselves. In another era, students would dress to make themselves presentable. Now students want to dress to make themselves at ease. The former generations thought of others; we now insist on putting ourselves first” (186). This is pretty indicting, but it also resonates with our own personal experience. The same students who will proudly don a basketball uniform will insist that the wearing of a school uniform strips them of their right to express their individuality. We are committed to growing in our students a sense of solidarity and a commitment to something greater than themselves in their attire. As best we are able, we are committed to engendering an appreciation for beauty, whether in the aesthetics of our facilities or in formal musical training in the elementary classroom. Our students won’t just sing a lot, we want to help them be able to read vocal music early in the grammar years. And there’s more that we will do, if God wills. But it’s not because we’ve arrived (we haven’t actually left yet), it’s because we’re committed to the leg of the pedagogical stool that many of our neighboring public schools have whittled to a nub.